This is Widder Curry’s Reading Fence. Click on it for a larger image. 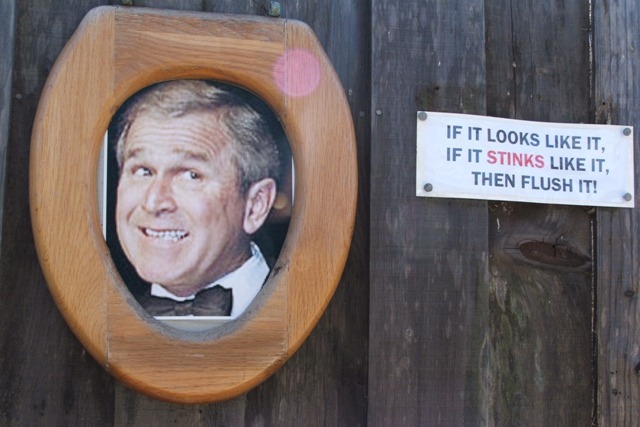 It is hard to believe that during the last presidential election my husband was alive and protesting the Bush regime. We first made contact with the OB Rag because of posters and/or pictures we had depicting our feelings. 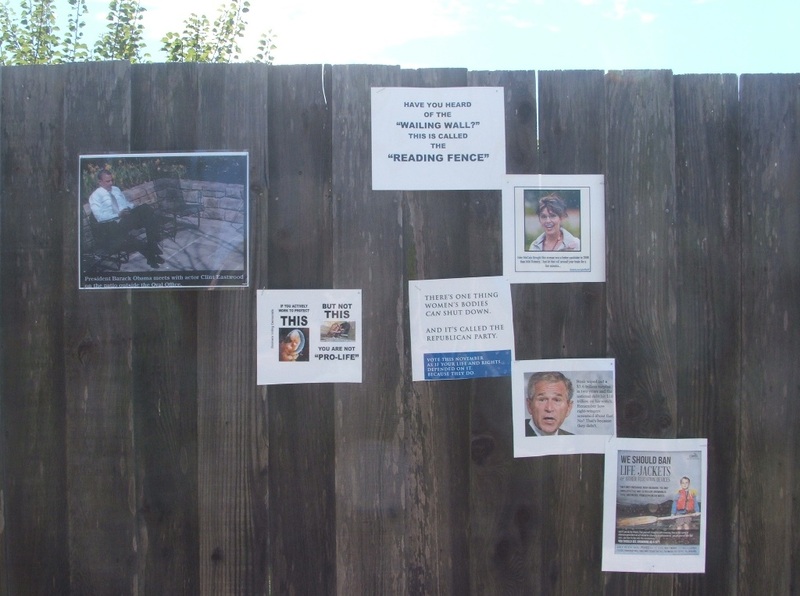 As the anniversary of his death of three years approaches, (September 21st) I feel it is only fitting to construct a “Reading Fence” of the current posters being circulated on the Internet. (Of course it must be realized that I am selecting only those that he would have approved of – which means that some of you will not approve of them). Oh well….he wouldn’t care – nor do I.
And…for those of you that think you can steal over here in the dead of night and remove then … I have many duplicates to replace them. 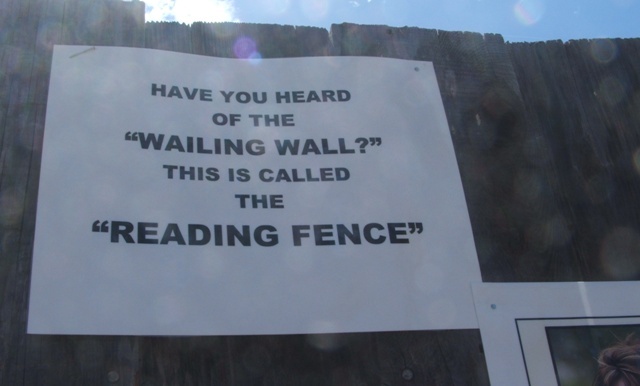 And…if you would want some for your own “reading fence” let me know. They are easy to come by. More posters will be added as the become available. « Audits? we don’t need no stinkin’ audits! 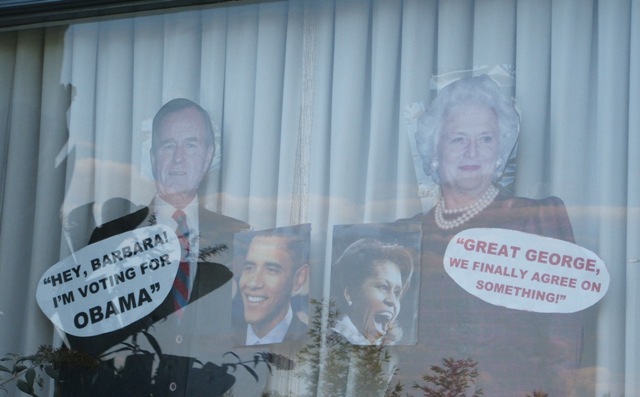 Judi, now you need to add some Romney/Ryan posters along the same lines. Or as Ryan called him in an interview with Brian Williams, “Rip Nomney.” In Obama’s speech last night he used the word “failings” referring to himself. I thought this was very unfortunate because the Republicans will jump on this, take it out of context and use it against him in an ad. Obama needs to be more aware of the words he uses, and expect that they will be taken out of context. Thanks, John. Love the “Rip Nomney” line!